This event unlocks long hairstyles for your female adult sims. 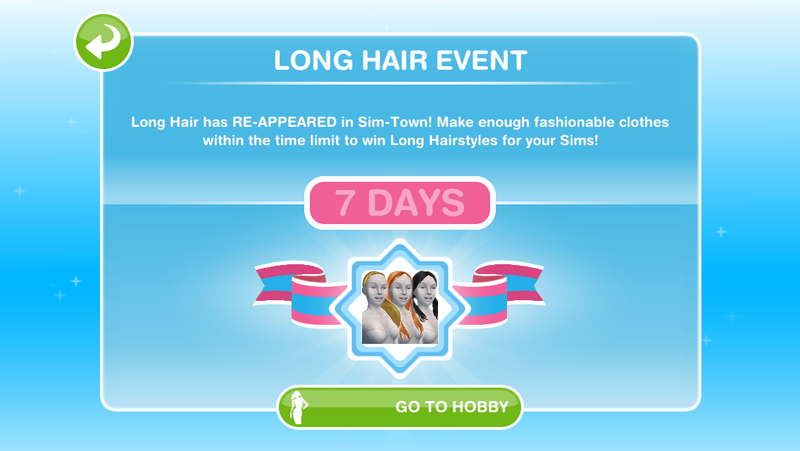 To get all 9 long hairstyles you need to complete the fashion designer hobby collection 9 times in the 7 day time limit! You get a new hairstyle at random each time you complete the collection (find all 12 fashion pieces), once you unlock a hairstyle you get to keep it even if you don’t find them all. This post shows you what the hairstyles all look like. If you click no you can start it from the active tasks tab, you will not get any extra time if you start this late. YOU NEED TO COMPLETE ALL FOUR ROWS (FIND ALL 12 FASHION PIECES) TO GET ONE HAIRSTYLE! -most importantly: just keep going! I know it’s annoying when you get the same one constantly (those heels are a nightmare!) but you will eventually get the ones you need. When do I get the hairstyles? I’ve completed a few of the fashion collections but haven’t got any hairstyles yet? Did you get the pop up for this event? If not you have probably completed it already and can find these hairstyles in your wardrobe.